Our comprehensive trend themes are designed to keep you in the look of the latest design styles, helping you to plan your future collections, confidently. The Resistance Trend Forecasting book comes with two decoding books that interpret the trend drivers into fashion design, including: Womenswear, Menswear, and a special edition for Muslimwear. Please do contact us at cs@bdadesign.co.id if you’re interested shaping the better future together. At Indonesia Fashion Week 2015, BD+A Design has launched the 7th Trend Forecasting Book for the year 2016/17. Humans will continue to face challenges that could disrupt the continuity of human life itself. Therefore, people need to protect themselves from challenges such as the scarcity of natural resources, quality of life that keeps declining, the extreme climate change that begins to destroy human habitat, as well as the political turmoil that continues to fluctuate. 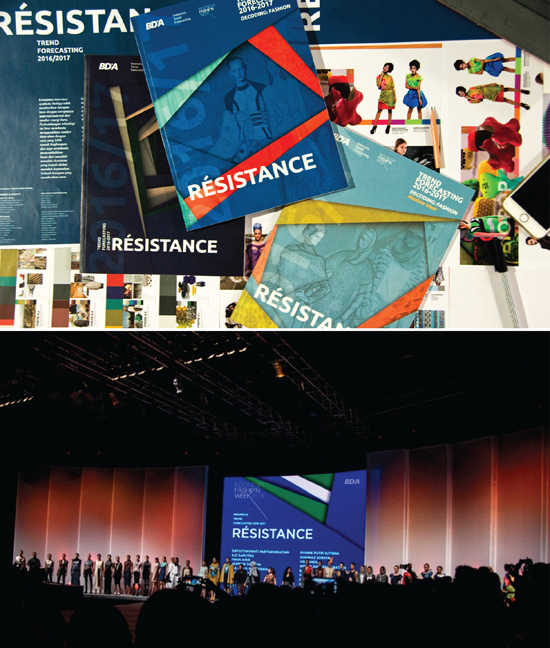 Those things are the inspirations / drivers for the main trend forecasting theme in 2016/17, Resistance, which is derived from the resistance, which means to take the fight to protect. The book comes with two decoding books that interpret the trend drivers into fashion design, including: Womenswear, Menswear, and a special edition for Muslimwear. Its ‘decoded’ collection has exhibited successfully at the prestigious runway of Indonesia Fashion Week 2015. 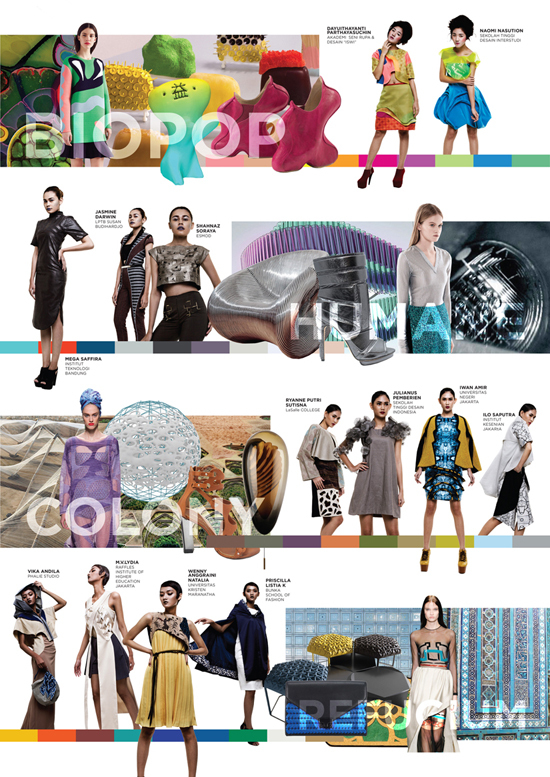 At Indonesia Fashion Week 2014, BD+A Design has launched the 6th Trend Forecasting Book for the year 2015/16. 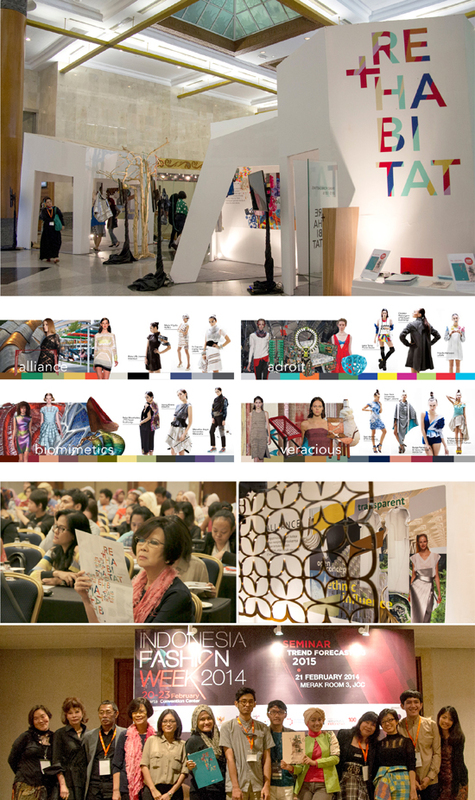 Each year the Design Alliance Asia (tDAA) brings to the host country its signature ‘AsiaMeets’ programme, a series of presentations on recent developments in design, lifestyle trends, or key projects by each of our member countries. BD+A Design as tDAA Indonesia representative will be the host for this year’s AsiaMeets on 29 September – 3 October 2013 in Bandung, Indonesia, with more than 40 attendees from Hong Kong/China, India, Laos, Lebanon/Middle East, Malaysia, Philippine, Singapore, South Korea, Taiwan, Thailand and Vietnam. 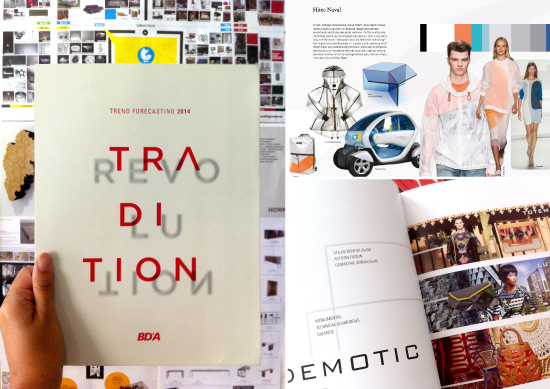 The Trend Forecasting 2014 ‘Tradition Revolution’ book will be launched on 16th May 2013 at Jakarta Fashion & Food Festival (JFFF) in Mal Kelapa Gading Jakarta, Indonesia; with extra pages of ‘Indonesian Design Review’, alongside with decoding book in Fashion; ‘Fashion Trend Forecasting’. ‘Tradition Revolution’ will be the main theme and presented live at the seminar by Irvan A. Noe’man, Dina Midiani & Tri Anugrah from BD+A Design, Jakarta; while Isti Dhaniswari will speak about the history of tradition revolution through a recorded video from Germany. Hong Kong Design Institute (HKDI) and Hong Kong Institute of Vocational Education (Lee Wai Lee) (DILWL) and the Design Alliance Asia (tDAA), one of Asia's most extensive creative networks are collaborating on this research and exhibition project held at the d-Mart, HKDI on November 2012 – February 2013. Colours have contrasting associations in different cultures, and the symbolism attached to them is a powerful way to express cultural uniqueness and meaning amongst different Asian countries. 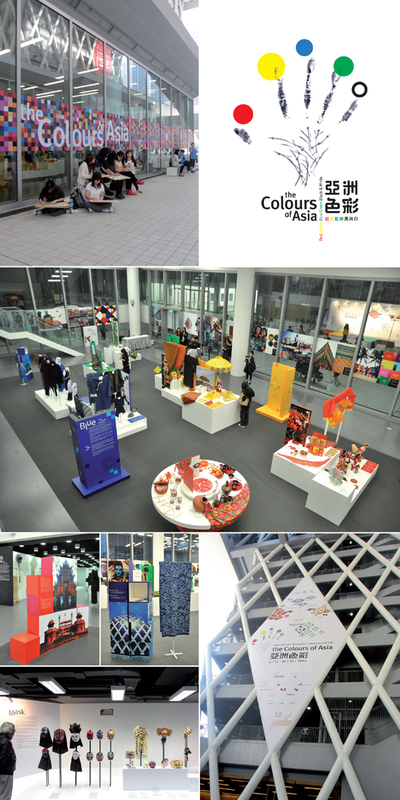 CoA is an ambitious project bringing together members of tDAA from 13 Asian regions to research the implications of colours resulting in creative designs and resulting in an exhibition in Hong Kong. The exhibition aims to foster exchanges of creative ideas and comparative studies of culture through designs focusing on the use of colours. The exhibition will also help to generate a creative cultural environment within the local design community and the general public to develop quality appreciation of artwork in Asian cultures. 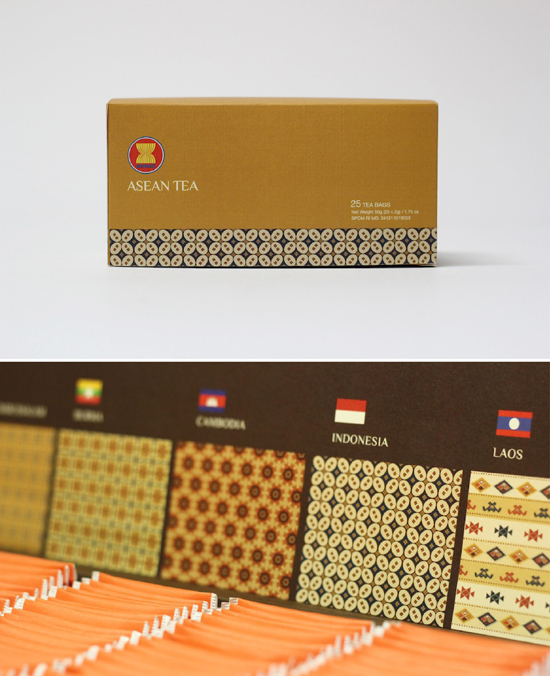 A result of a wonderful design research project we worked on at BD+A Design (Indonesia) in collaboration with our Design Alliance Asia Partners from 13 different Asian countries that are China, Hong Kong, India, Laos, Lebanon/Middle East, Malaysia, the Philippines, Singapore, South Korea, Taiwan, Thailand and Vietnam. Colours of Asia will showcase the creative artworks and traditional objects from these regions to reinforce the development of research study in Asian cultures and inspire the interest in cultural studies in the region. Audiences are encouraged to learn more about the meanings of the associated colours through different visual images and artifacts. a series of designs by Irvan A Noe’man. 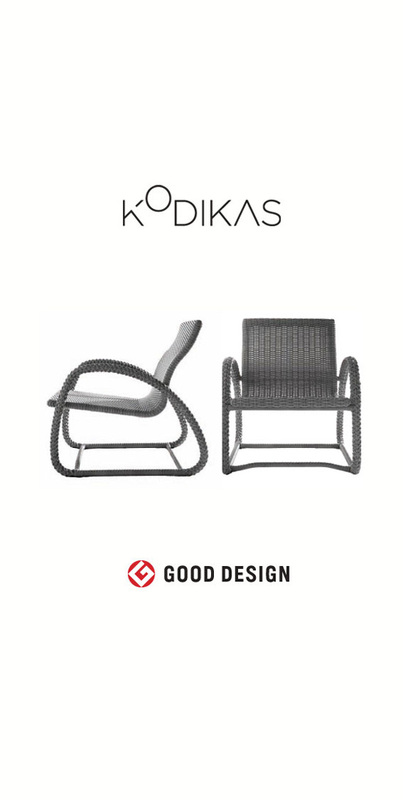 Kodi Kanta is a lean back single chair with a light overall weight and a combination of two kinds of wicker patterns is the advantage this contemporary design furniture. Based on design principle, this product is inspired by the human body, the curve made on the back rest and the low level height of the seat is to optimize the comfort and sitting proportion. Kodi Kanta 1 has succeeded in an International Design Award known as “Good Design Award 2012” held in Japan.